Another photo from the MRO spacecraft spotted the car-size Curiosity rover's parachute and protective backshell, which were jettisoned by the rover during its Aug. 5 landing. A previous photo by MRO taken on Curiosity's actual landing day captured an image of the Mars rover hanging from its parachute. Scientists used the High-Resolution Imaging Science Experiment, or HiRISE, camera on the MRO spacecraft to take the new photos, which have created a buzz among the Curiosity rover's science team. "The HiRISE camera on MRO continues to take amazing photographs of Mars, and of us on Mars," said Mike Watkins, Curiosity mission manager at the Jet Propulsion Laboratory, in a briefing today. This color view of the parachute and back shell that helped deliver NASA's Mars rover Curiosity to the Red Planet was taken by NASA's Mars Reconnaissance Orbiter. Image released Sept. 6, 2012. The photo of Curiosity also includes the rover's landing spot and shows the scorch marks left behind by the rockets on the sky crane that lowered the rover to the Martian surface. "It's a great image of where we stand relative to the touchdown point now," Watkins said. This isn't the first time the MRO spacecraft has captured views of rovers on Mars. 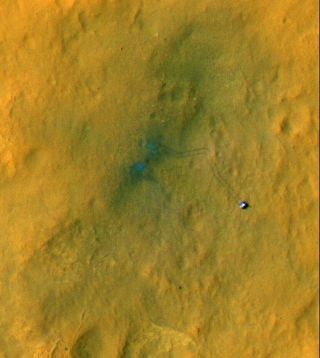 The orbiter repeatedly observed NASA's smaller Mars rovers Spirit and Opportunity as they explored the Martian surface following their own landings in January 2004. The Spirit rover's mission was declared over last year, but Opportunity continues to rover across the Martian plains of Meridiani Planum. The Mars rover Curiosity took its first drive on Mars on Aug. 22 and completed its longest drive, a 100-foot (30.5 meter) trek, on Tuesday (Sept. 4). So far, the rover has driven a total of 358 feet (109 meters) on Mars, but is actually just 69 feet (82 meters) away from its landing site due to the turns the rover has performed along the way. Mission scientists have also tested the rover's mast-mounted cameras and laser, which is used to study the composition of Martian rocks, and are preparing a weeklong set of tests to calibrate Curiosity's instrument-tipped robotic arm. NASA's $2.5 billion Curiosity rover is designed to spend the next two years exploring the vast Gale Crater on Mars to determine if the area could have once supported microbial life. Mission scientists also plan to send the rover up Mount Sharp, a 3-mile-high (5-kilometer) mountain rising up from the center of the crater.